VALDOSTA, Ga. May 13, 2014: With no truck or trailer to transport the Aruba.com Jerry Haas Mustang from it’s shop in Union, S.C. to the PDRA Georgia Drags, Team Aruba could have easily been sidelined as they awaited the arrival of their new hauler. However, thanks to the generosity of their chassis builder Jerry Haas, Team Aruba not only made it to the Georgia Drags, they made it all the way to the final round. Haas did his part in getting the beautiful, Aruba-themed Extreme Pro Stock Mustang to the track and Team Aruba did the rest. Trevor Eman qualified fifth in the XPS field with a 4.12. He took out number four qualifier, North Carolina’s Jeff Dobbins in round one. Then edged out another Carolina racer, Richard Penland, in a semi final round pedal fest. The finals pitted Team Aruba against Cary Goforth who won the PDRA opener at Rockingham Dragway. Although Eman posted a nice 4.167 run at 175.30 MPH, Goforth crossed the stripe first with a 4.153 at 175.84 MPH. “First and foremost, I need to compliment my team,” thanked Eman. “Everybody worked very hard, and we can see the end result of that. Jerry Haas Race Cars, Jon Kaase Racing Engines, RAM Clutches, Braswell Carburetion and Penske Racing Shocks have helped us with all the components and tools needed to have a top performing Pro Stock Mustang. “I and the rest of the team would like to extend our sincere gratitude to Jerry Haas. After hearing that we sold our trailer and that we are still waiting on delivery of our new one, he offered to carry our car and equipment to Valdosta. So, without his transportation support, it would have been rather difficult to even get to the race, let alone make it to the final. With the Georgia Drags under its belt, the PDRA is now just two races old, but has won fans and followers across the industry. 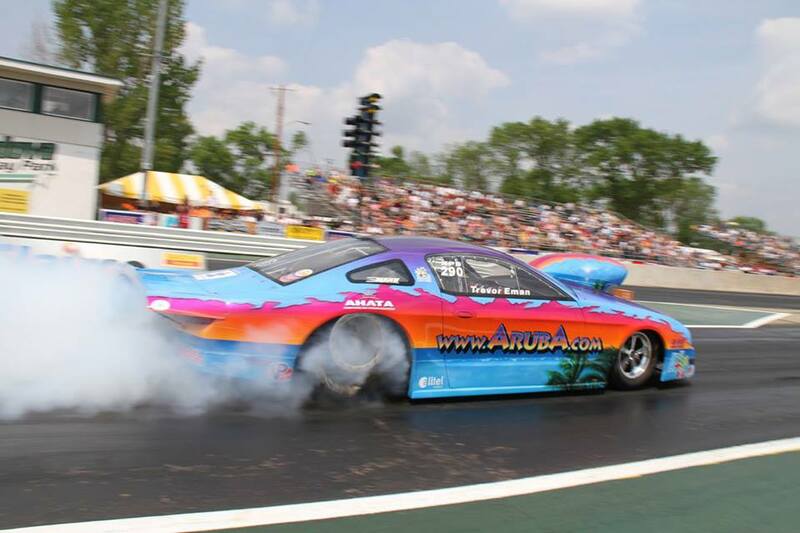 Team Aruba was pleased with the efforts they saw at the Georgia Drags. Team Aruba had qualified on the pole at their last visit to South Georgia Motorsports Park, but rain canceled the weekend before the team had a chance to defend the pole in eliminations. Although the team would surely have liked to have taken home the trophy at the Georgia Drags, a runner up finish provided some satisfaction for their unfinished business of 2013.